For the best part of two centuries, Scottish Fixed Engine (more commonly known as Bag Net Fishing) around the Scottish coast was a significant seasonal employer. During the winter, men would gather ice from the Lochs and store it inside underground icehouses, until the fishing season commenced in the Spring/Summer. Ice was used to preserve the Salmon and Grilse, between being caught, and reaching the market. In some areas, the fish was boiled or pickled to preserve the product. The fish would be transported via the railway line to markets all over the UK, with the bulk of Salmon ending up in Billingsgate. Some of the larger East coast fisheries exported Salmon in barrels to Europe. The traditional design and construction of a bag net has not changed dramatically over the last two centuries. Nowadays, the nets are now made of synthetic rope and netting, making the nets stronger and lighter to work with. 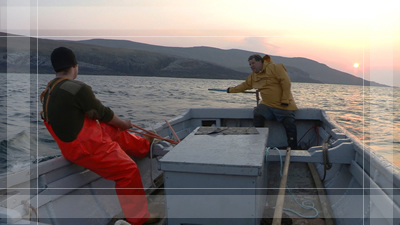 From 2010, all Salmon purchased from Armadale Salmon Fishing will be given a traceability tag, giving you added re-assurance that you are buying salmon which have been caught legally. traceability is an important decision factor when purchasing quality produce. Despite there being no legal requirement to tag our produce, we feel this will provide you with confidence and allow you to know a little more about where the product originates. Our tag is recognisable, with a blue saltire, telephone number and website address.